Co-corresponding author, Professor Ian Graham, from the Centre for Novel Agricultural Products, Department of Biology at the University of York, said: "Biochemists have been curious for decades about how plants have evolved to become one of the richest sources of chemical diversity on earth. Using high quality genome assembly, our study has deciphered how this has happened in opium poppy. "At the same time this research will provide the foundation for the development of molecular plant breeding tools that can be used to ensure there is a reliable and cheap supply of the most effective painkillers available for pain relief and palliative care for societies in not just developed but also developing world countries". The scientists from the University of York and Wellcome Sanger Institute in the United Kingdom together with colleagues from Xi'an Jiaotong University and Shanghai Ocean University in China and Sun Pharmaceutical Industries (Australia) Pty Ltd, produced a high quality assembly of the 2.7 GigaBase genome sequence distributed across 11 chromosomes. This enabled the researchers to identify a large cluster of 15 genes that encode enzymes involved in two distinct biosynthetic pathways involved in the production of both noscapine and the compounds leading to codeine and morphine. The genome assembly allowed the researchers to identify the ancestral genes that came together to produce the STORR gene fusion that is responsible for the first major step on the pathway to morphine and codeine. This fusion event happened before a relatively recent whole genome duplication event in the opium poppy genome 7.8 million years ago. Co-corresponding author Professor Kai Ye from Xi'an Jiaotong University said "A highly repetitive plant genome and the intermingled evolutionary events in the past 100 million years complicated our analysis. 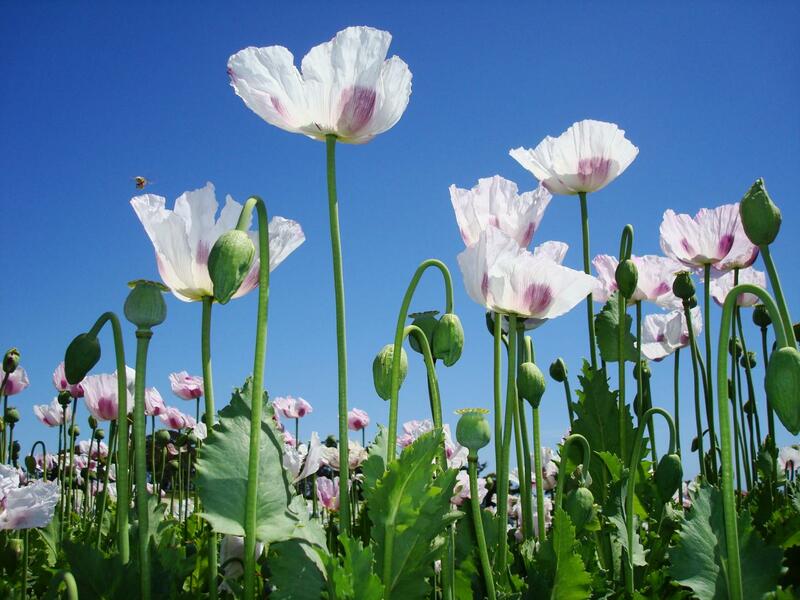 We utilized complementary cutting-edge genome sequencing technologies with sophisticated mathematical models and analysis methods to investigate the evolutionary history of the opium poppy genome. "It is intriguing that two biosynthetic pathways came to the same genomic region due to a series of duplication, shuffling and fusion structural events, enabling concerted production of novel metabolic compounds." Joint first author Professor Zemin Ning from the Wellcome Trust Sanger Institute said "Combining various sequencing technologies is the key for producing a high quality assembly for opium poppy genome. With a genome size similar to humans, the main challenge for this project was to handle repeat elements which make up 70.9% of the genome."